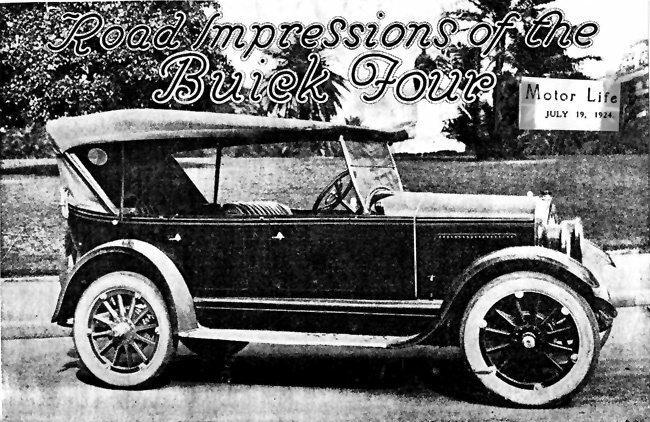 One of the best-known American cars on this market is the Buick. As is well known, this car is made in two models?the six-cylinder and the four-cylinder. We have already taken the Six over our standard course, and, in response to several requests, we recently tried out the four-cylinder car. In many respects, this is very similar to the Six, although, of course, the car is smaller and is naturally lower priced. The four-cylinder engine is fitted with overhead valves, which have been a feature of Buick cars for many years. In fact, Buick had a great deal to do with the present popularity of this type of engine. The cylinders have a bore of 3 3/8 inches and a stroke of 43/4 inches. These cylinders are made from a semi-steel material. The crankshaft is a sturdy unit, and runs in three very large bearings. The pistons, connecting-rods, and fly-wheel are balanced to ensure smooth operation at all speeds. The valves are large, and are operated by automatically lubricated, adjustable push-rods. These are commendably silent in operation. All cylinders and valves are surrounded by water-jackets, and circulation is maintained by a centrifugal pump, driven by spiral gears. The engine dimensions mentioned above give a nominal horse-power of approximately 18, but actually the engine develops 35. This engine is suspended at three points in the main frame. Lubrication is by the constant-level circulating splash system. Oil is circulated by a gear-pump, driven by spiral gears from the camshaft, and completely enclosed in the lower part of the crankcase. A rather interesting feature is the provision of an automatic clutch on the pump-shaft, which puts it out of action should breakage or freezing occur. There is an oil-measure gauge and draining plug located on the crank-case, and an oil-pressure gauge on the instrument-board. The carburettor is of the improved automatic float-feed type. The vacuum system connects it with the petrol tank at the rear of the chassis frame. In order to ensure proper vapourisation, an automatic heat control is provided. There is also an air-regulator on the instrument-board. Ignition is by the Delco system. Spark advance is automatic; but, in addition, a manual-control lever is situated on the top of the steering wheel. The Delco system is also used for the electric starting and lighting. This is properly designed for the engine, so minimising the possibility of trouble. The engine is connected to the gearbox by a dry-plate clutch. This is extremely easy to operate, only the lightest pressure being required to throw it out of engagement. The adjustment is also simple and accessible. In common with the majority of modern cars, the transmission is of the selective sliding-gear type, with three speeds forward and one reverse. The change-speed lever is centrally disposed. The gear change is one of the features of the Buick car, being extremely easy to operate. Indeed, the veriest novice can change gears without clashing them. The transmission is mounted in unit with the engine. From the transmission, the drive is taken through a large automatically lubricated universal joint. The propeller-shaft is enclosed in a torque tube, and it operates spiral bevel gears in the differential. A large ball joint, enclosing the universal joint, connects the propeller-shaft housing to the rear end of the transmission. This ball joint and propeller-shaft housing take both torque and drive. The rear axle is of the three-quarter floating type. All the weight of the car is taken on the axle housing, only driving torque and steadying of the wheels being taken up by the axle-shafts. The differential and road wheels are mounted on heavy bearings, and the pinion shaft is mounted on an extra large ball bearing. The spiral gears and the axles are fully adjustable. The front axle is of the reverse Elliott type. This has been adopted because it has been found that it is the most suitable type when four-wheel brakes are employed. We shall refer to these later. The steering knuckles and tie-rod yokes are double heat treated and drop forged, the front wheels being securely mounted on ball bearings. These wheels are of the artillery type, and have demountable rims. If desired, wire wheels can be obtained at a slight extra cost. Brake drums are bolted securely to all wheels, and are 12 inches in diameter. Cord tyres are standard equipment on all Buick Four models. They are 31 x 4, the front ones having ribbed treads, the rear ones being of the anti-skid type. Steering is by the semi-irreversible split bronze nut and worm type. There is a large adjustable ball-thrust bearing for taking up wear. The steering-wheel is 17 inches in diameter, and is surmounted by the horn button and spark and throttle levers. The chassis frame is of reinforced pressed steel, the side-members of which are of ample depth. Five heavy cross-members increase its strength. The front spring shackle has a stop to prevent shifting of the axle. This stop is integral with the bracket which carries the front brake rocker. Semi-elliptical springs are fitted fore and aft. The wheel-base is 109 inches, while the track is the standard 56 inches. The four-wheel brakes, which are operated by the foot-pedal, are of the external contracting type. In order that steering way may be maintained at all times, when turning a corner, the outside front brake is automatically released. The hand brake is of the internal expanding type, and operates on the rear-wheel brake drums only. Both sets of brakes, of course, are fully adjustable for wear. The car which we tested was fitted with the standard Australian body work. This, although not ornate, is very well made, and has pleasing lines. The upholstery is of solid leather. It is comfortable, and there is plenty of room for five passengers. Included in the standard equipment of the car are combination dim and full head lights with anti-glare lenses, parking lights on the scuttles, tail-lamp, and instrument-board lamp. The electric horn is of the motor-driven type. The transmission lock and scuttle ventilator are other features of the car. Mounted on the instrument-board are speedometer, ammeter, oil-gauge, and lighting switch. There is also the carburetor control mentioned before. The steering-wheel is made of a black hard-rubber material, and is very pleasant to the hand. All controls are within easy reach. The car which we tried was running light?i.e., there were only two persons in it. In addition, the tyres were pumped very hard, so that the car had a tendency to pitch on rough roads. With a full complement of passengers, however, we have no doubt that the car would have held to the road in a much better manner. The four-wheel brakes proved to be very efficient, pulling the car up without any tendency to skid. As it happened, rain was falling on the day of our test, so that we had a good opportunity of proving the efficiency of these brakes. The engine has a most healthy sound, and, as can be seen by the results of our test, listed below, is well up to its work. The results are as follows:? Convent Hill: Passed the shops at 15, quickly picked up to 25, rounding the first bend at 27, slowing down to 25 at the second bend, then to 22, rounding the third bend at 20. The car picked up to 22, and rounded the last bend at 26, finishing the climb at 30 m.p.h. Cranbrook Hill : Started at 15, picked up to 20, dropped to 15, when a change into second gear was made. It then quickly picked up to 20, then 22, when a change was made into top gear, and it dropped to 20, which speed it maintained for some time. When it had dropped to 15, however, second gear was engaged again, which quickly brought the speed up to 20 when top gear was engaged, the climb being finished at 25 m.p.h. Edgecliffe Hill: Started at 15, picked up to 20, dropped to 18, when second gear was engaged, quickly picked up to 20 again, at which speed it finished the climb. Woollcot Street: 15, 20, 26, 30, 27, 25, 22, 20, 18, 17, 20. Accleration: 10 to 30 m.p.h. in top gear, 10 seconds; 10 to 30 m.p.h. in second gear, 9 seconds. Maximum speed in second gear, 35 m.p.h. It will be noticed from the above that on two of the hills second gear was used. This was in order to obtain fast climbs; but, from the behaviour of the car, we think that it could have surmounted all the hills in top gear.